Last week we learned that loads of readers enjoy the store finds posts, so no worries: we'll continue the series! For now we'll continue in the same format, but if you have any feedback on how or when we write about store finds, then you're absolutely free to send us your thoughts! For this week we have a rather large set of finds from around the globe, so enjoy! It's Amazon Prime Day today, which means that Amazon is once again spoiling prime members with discounts and offers. 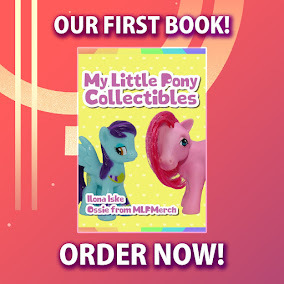 This is the 3rd year they host this day, and just like the previous years there are several deals on My Little Pony merch as well! In order to get the provided discounts you need to be an Amazon Prime member. If you're already a (student) member then that's perfect. If you're not a member yet you can try the 30-day trial, which you can stop at any moment afterwards. And note that these deals are only valid for today! 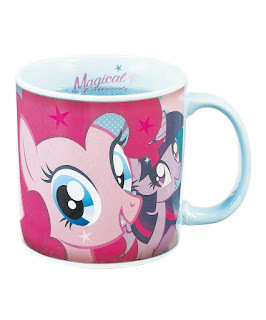 There's a new 3-day sale on My Little Pony merch at Zulily right now, with discounts ranging from 20-65%. At this moment the sale lasts about another 2 days and to help you scroll through all the items we've made a selection of new and interesting items that are discounted right now. New items included 3D lights, comic bundles and the return of G1-inspired merch. Enjoy! A little while ago we reported on an exclusive range of My Little Pony items at 390 store in Japan. 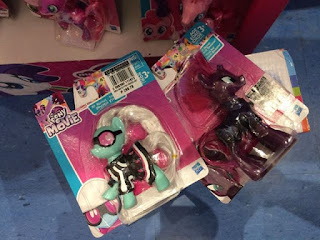 Merch hunter Joelle has managed to get some of the items from Japan and made some detailed photos of it, which we'll share in this post. All items are priced at 390 yen, which is about $4, and are only available at 390 store. 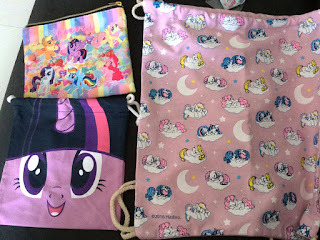 As you can see in the images it's mostly accessories that they sell, but bags and pouches are also available. Joelle also reported that the hair clips and keychain are made of a wood-like material, which in any way sound better than brittle plastic. The items are still available, and if you happen to live in Japan you can check out their store on Rakuten for all items. 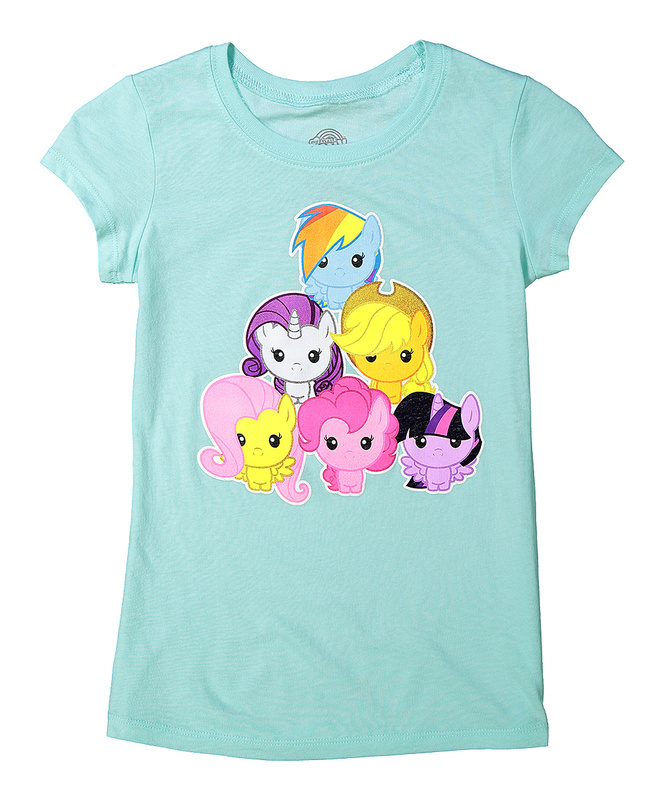 Huge My Little Pony Sale at Zulily - Up to 60% Off! 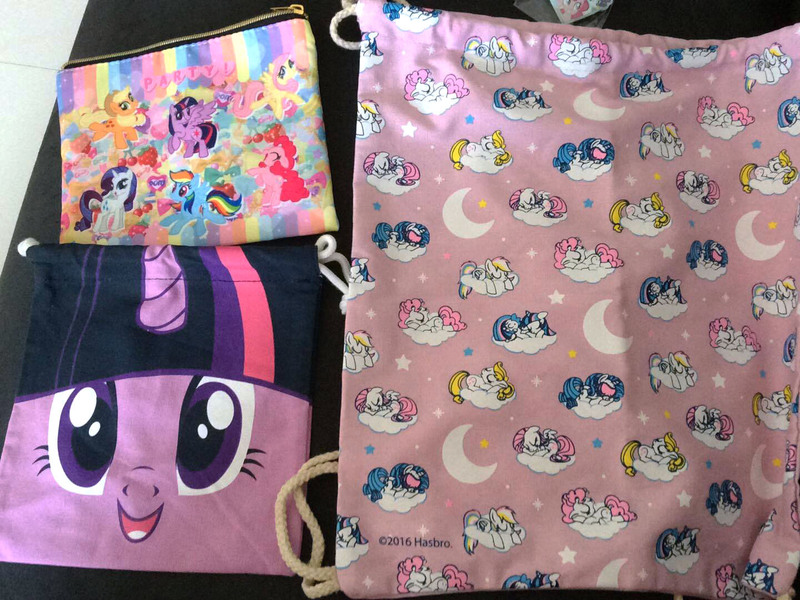 Zulily has once again started a huge sale on My Little Pony merch, this time with over 500 items available! 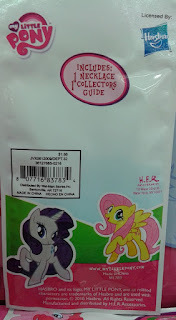 Quite a lot of costumes and accessories are available, so if you're planning on dressing up or like to have some MLP-inspired jewelry you might just find what you need! Of course regular figures, plush, shirts and other items are included as well. Below you can find our favorite picks of this sale, but over on the My Little Pony Sale page you can find everything! But keep in mind: Zulily sales only last 3 days! 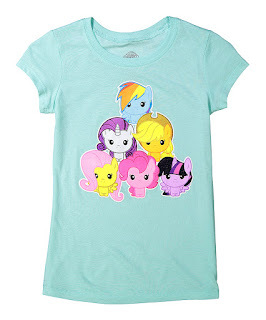 Zulily occasionally starts a huge My Little Pony sale, and there is another active one right now! You can find all items on the My Little Pony product page, but below we've also selected a few deals they have on offer, focusing mostly on new items, so be sure to check those out. 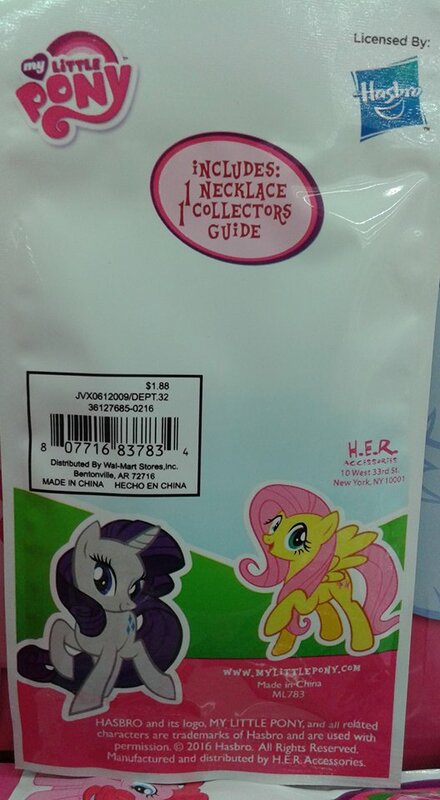 A new kind of MLP blind bag is currently available at Walmart: Mystery Necklace Packs by H.E.R. Accessories. We don't have much info on them (nor does the H.E.R. website list their products), but these seem to be metal heart-shaped keychains. These could be compared with the blind bag dog tags, but of course with another shape and designs. Every pack contains a necklace, including both the pendant and chain, and a leaflet with all available designs. They're exclusively available at Walmart for $1.88 each, and if anyone knows more about the available designs then please let us know! Thanks to Michelle for the photos and info! Walmart is currently selling these collectible bracelets for only $1 each! 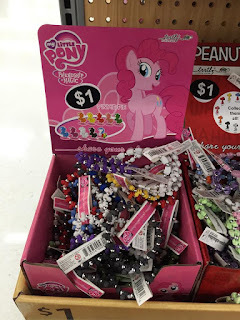 The bracelets have multiple Pinkie Pie-shaped wooden charms and metal balls. 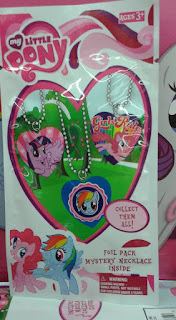 The Pinkie Pie charms come in 9 different colors and a multi-colored variant as well (1 color per bracelet). The bracelets are manufactured by Trrtlz, a company known for their licensed and non-licensed bracelets, just like these. Thanks to Rarishy and Erica for the images! 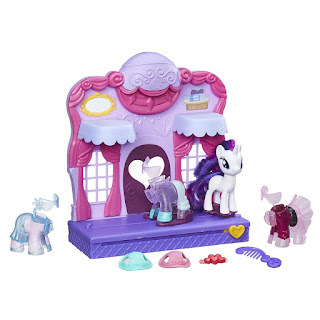 Zulily has started a sale on My Little Pony products today, with mainly jewelery and a few other items. The jewelery on sale is made by World Trade Jewelers, of which we made a special post last year. Various pendants, earrings, necklaces and bracelets are available for 30-60% off. In addition to the jewelery there is also some clothing and two LED Christmas ornaments on sale. Zulily requires you to get an account before you can see the sale, so be sure to create your account here first. 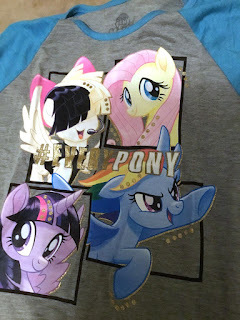 Once you have an account you can search for My Little Pony, or use this link. (You might need to select US or Canada as your language in order to see most of the items). Be sure to do it quick, as this event ends in just 24 hours!